The word market brings back some of my sweetest childhood memories. My dad was (and still is) the grocery shopper and sometimes he would insists that I tag along. I must admit that I didn't enjoy the trips to Coimbatore markets much. How can I, when I have been to much better markets in Madurai with my grandmother. We always looked forward for the trips to Madurai during our school holidays. If one were to put all my paternal cousins in a room, we could easily make 2 cricket teams including substitutes and umpires and still would have few left for audience. My grandmother took us all (well most of us younger ones, the older ones had far more important things to do) with her to the markets. I simply loved it. She would get us steamed or grilled corn on the cob and lots of raw mango seasoned with chilli powder and salt. My granny had a unique bargaining style, which always swinged her way. She could have taught Hillary a helpful trick or two, if she were alive now. And of course she knew all the vendors by name and found time for family/market gossip with them. I think my love for markets started there. Then there were the trips to maternal grandmother's village. A small tiny village that wouldn't show up on any map, however much one zooms in. In contrast, I was the oldest grandchild to my maternal grandmother and enjoyed a special privilege (still do) in the family. There were no markets in the village, so the fruits and vegetables came from the fields, milk from the herd, the chicken from the pen and mutton only on very special occasions (like when the son-in-laws came for a visit). Back then there was a concept called santhai (sort of farmer's market), where one came to buy and sell their produce. It was generally held in the nearest town. The connection to the town was by a bus which made 3 trips daily. My granny took us to the town in the morning on the day of the santhai, the long narrow road winding its way through many more tiny villages. The bus was filled with people who somehow were related to one other and would in turn fill the bus with baskets and fellow passengers with happenings in their village. The mornings were spent in the markets and my granny would treat us to lunch in one of the eateries and then there would be a movie in the afternoon. After which we went back home in the evening bus. What I loved about the trips were the santhai and seerani (a sweet that is very special to the town, I have never seen it anywhere else). The smell of the market and noise with all that battering was such a glorious experience. As a child I would stare wide eyed at the wares on display and enjoy the snacks that my granny brought me. She would meet a whole load of her relatives and friends (she was a teacher and it seemed to me that she knew everyone). One of those relative-meeting gave me a fascinating insight to my grandmother's life, the one I didn't know about. She is one of those million unsung feminist in the world, without whom the things we take for granted (like education for girls) wouldn't have happened. She was a truly remarkable person and I attribute my fiery feminism to her influence. Last week my mother described about this new supermarket near our home in Madurai during our weekly telephonic conversations. My heart skipped a beat when she explained about the rows of vegetables and fruits and the cool air conditioned room they were stacked in. Wal mart I hear is steering to swipe the small markets off in the premise of 'more choice for customers'. Luckily there are 4 farmer's markets around the area I live. I cannot visit the Solihull market as it is on a Friday. But the others which are on Saturdays, I make a point to visit with the troops on toe. Below is a picture of some produce from the Kings Norton Farmer's market. No more corn on cob for the kiddes, it is hot dogs now. But at least I know the sausages are devoid of the dreaded 'Es' and the bread is whole meal, organic. 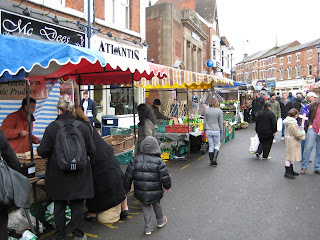 Another picture of Moseley Farmer's market where one can buy Ostrich burgers. I somehow think shopping in the farmer's markets would cultivate a sense of respect for the food we eat in the children and hopefully they will follow the tradition as adults. I had a write up of markets lying in the Draft for quite some time. When Gay of Scientist in the Kitchen announced the 'To market, to market' event, the post has been dusted and is now ready to enter the event. I am looking forward for the round up and reading about markets all around the world. Hi Devi, love your market post. I think Gay might have got your link wrong in the roundup - you might like to check it out. Just want to say that I enjoyed your blog. I have always sucked at cooking and hence have never really shown any level of interest in the art. Recipes that I tried from the internet always failed. But, after I discovered your blog in the past couple of weeks, I have tried several of your recipes - meen kozhambu, chettinad mutton curry, okra kootu, chicken briyani and I must say I have turned out to become a good cook overnight. My husband is thrilled and so are my friends and now i am a convert. The food really tastes good as promised. The accuracy of your instructions on the recipes is commendable and it like cooking tips for the dummies and anybody can succeed. Thanks for opening your kitchen to the world and giving me the confidence to step into my own kitchen again. Sorry for the long comment but it had to be said! I really enjoyed reading about your pattis (grandmothers). You brought out so many wonderful memories. I love farmers market too. Keep posting. To a homebody like myself, this looks like a wonderful and exciting adventure. Thanks for sharing this experience! 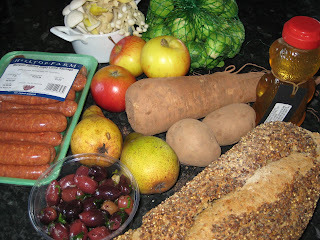 Nice post..first time to ur blog..u have really nice recipes..
Looks like a fantastic farmer's market! My dad did (and still does) all the shopping, too! Nice write up....first time here..ypu have some yummy recipes here.